The Steerable Punch is the first product of our advanced arthroscopic surgery line. The Steerable Punch is the first steerable, detachable and fully cleanable arthroscopic cutter for knee surgery. Steerable arthroscopic instruments drastically reduce the number of pre-bent instruments needed per surgery. In addition, they allow the surgeon to steer towards remote locations with ease. With its steerable tip, the Steerable Punch can easily reach hidden surgical locations, reducing time and risks, and replacing the need for multiple pre-bent instruments. Platform technology based on a cable-less design that is easy to disassemble for inspection, cleaning, and sterilization. A simple cleaning process allows the Steerable Punch to be reused over a prolonged period. The Steerable Punch is the first fully detachable and reusable arthroscopic cutter that allows the surgeon to steer the tip inside the joint during knee surgery. This single instrument offers the required extra reachability in the knee joint and therefore replaces multiple pre-bent cutting tools. Its intuitive design allows the performance of meniscectomies to be completed successfully without compromising the surgeon’s comfort. The cable-less and detachability features allow for an easy cleaning process. Steerability is achieved by our multi-patented Shaft Actuated Tip Articulation technology (SATA), developed in close collaboration with the Delft University of Technology. It allows the tip to be positioned at all possible angles between 55 and -55 degrees and simultaneously allows precision cutting of tough tissues within one single instrument. For the surgeon, using the Steerable Punch improves the reachability of the pathologic site, making a cleaner cut possible and reducing the stress in the surgeon’s hand and wrist. Moreover, the use of a single cutting tool optimizes the surgical workflow. Patients could benefit from less stress on the portal, decreased postoperative portal pain and reduced risk of tissue damage and infections, leading to a faster recovery. Hospitals would benefit from the reduction of instruments per surgical procedure in combination with a reduction in procedure time and post-surgical care time. 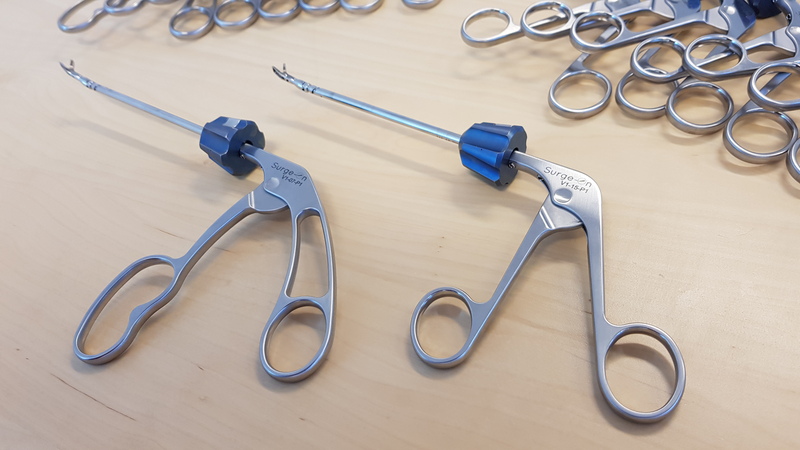 As minimally invasive operations are performed through small incisions, and the manipulation capability of rigid surgical instruments is limited, gaining access to the surgical site can be challenging. This is especially true for body cavities with confined spaces like the knee, the hip, and the ankle. Poor reachability results in unwanted workflow interruptions that increase the procedure time and causes stress for both the surgeon and the patient. Now, surgeons use up to 8 pre-bent punches per procedure to reach the pathologic area. 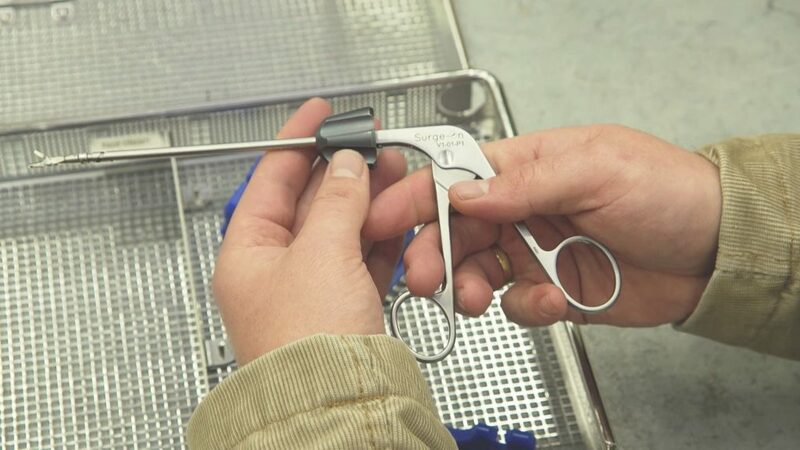 If the correct pre-bent instrument is not available, the instruments need to be forced for adequate beak-tissue alignment, ultimately increasing the risk for damage to healthy tissues. Besides the risk for the patient, surgeons can injure their wrist and fatigue their arm when instruments are used in uncomfortable positions. 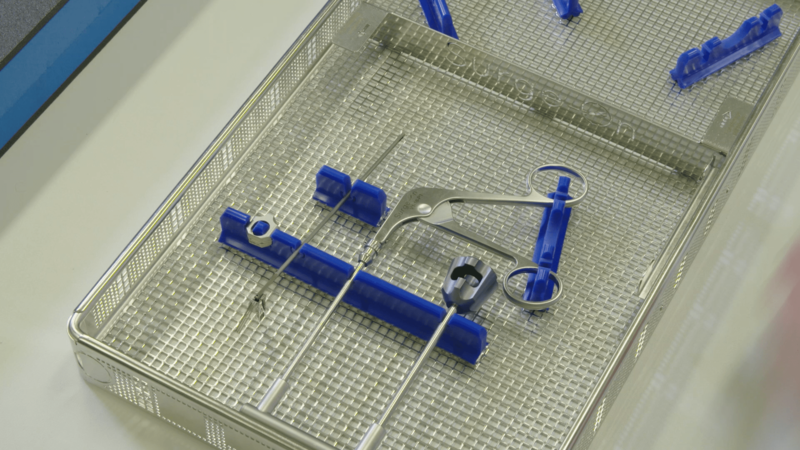 In addition, having multiple pre-bent instruments available during the procedure leads to relatively high purchase and sterilization costs. Watch the Steerable Punch in action during a meniscectomy! Surge-on Medical will launch the Steerable Punch on the market in 2019. Be an innovator! Pre-order the Steerable Punch. 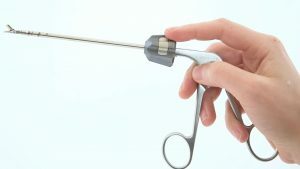 Its unique combination of features are essential aspects required in arthroscopic surgery that cannot be found in other endoscopic instruments. The Steerable Punch is just the first instrument in the line of steerable arthroscopic devices. Our multi-patented platform technology can be integrated into any surgical instrument with a round shaft. Soon, Surge-on Medical will adapt arthroscopic graspers, oval punches, scissors and more end effectors to the steerable tip to fulfill the needs of arthroscopic and trauma surgeons in all fields of interest. Copyright 2015-2019 © Surge-on Medical B.V.